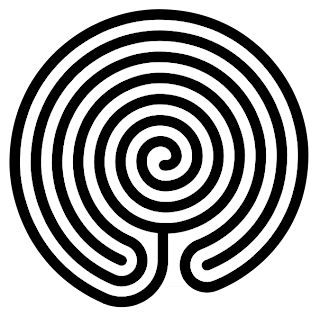 What is Chakravyuha: Chakravyuha is a spiral army formation like a blooming lotus when viewed from above. It usually has seven concentric rings of warriors. These rings usually rotate clockwise or anticlockwise. The Maharathis are placed in key positions for maximum effectiveness. The formation has an open gap for the enemy to enter which could be shut in need and replaced by another gap at a different space. The enemy who enters chakravyuha is forced to move in the direction of the center of the vyuha. As the enemy advances he finds himself in constantly difficult fighting position. The vyuha is said to be unbreakable from outside and can be broken only by entering it and then breaking it from inside. The Vyuha is similar to the idea of defense in depth. When one ring breaks the next ring acts as the outer ring to keep the enemy at bay. Possible countermeasures: I think the following methods could be used to break up such formation. Wedge Formation: A wedge formation is a ‘V’ shaped formation with the tip facing the enemy. This formation could attack a certain length of the enemy line with sheer force concentration at the tip with the flanks giving support. If the breakthrough is achieved the wedge the tip exploits it by attacking the next line. At that time the flanks enlarge the gap by attacking the troops of the broken line down its length. Thus preventing the closure of the entry. 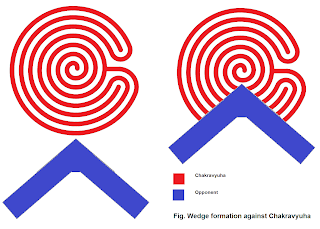 When the tip of the wedge reaches the center of the chakravyuha all the spirals are divided into two parts each facing enfilade attack from the flanks of the wedge formation. Now the chakravyuha could be destroyed in detail by gradually increasing the angle of ‘V’ and moving the flanks forward, eventually forming a line. This is very likely to result in routing the enemy or forcing them to adapt a different formation. a. Advantage: The wedge formation, once breakthrough is achieved, could exploit the gaps between two subsequent lines to destroy the enemy in detail. It would also prevent encirclement by the enemy and provide good support for own troops while doing heavy damage to the opponent. b. 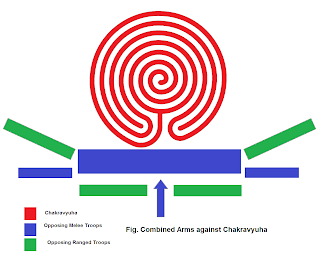 Disadvantage: The enemy could use the internal lines of the chakravyuha to reinforce the part of the line under attack which could prevent a breakthrough. 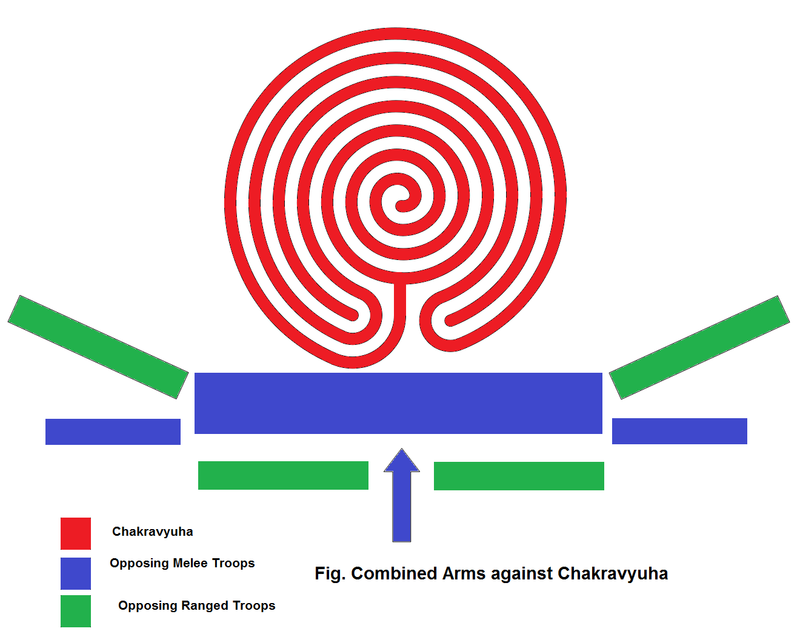 Another possible advantage of chakravyuha can be the rotation of troops which would exchange fatigued troops with fresh ones. Combined arms: This tactics would utilize the relatively rigid outer structure of chakravyuha whatever flexible the internal structure be. The friendly troops will form a line with a combination of both melee and ranged combatants. A handful number is to be kept in reserve to supplement the part of the line under attack. The chakravyuha being a large rigid circular structure will be able to engage a small part of the line. The reserves should be committed to reinforce the engaged part of the line. At the other part of the line the ranged troops will shoot upon the chakravyuha. They may form an echeloned formation for greater effect if necessary trainings are affordable, otherwise simple line formation would do. If chakravyuha moves to engage the flanks, the new segment of line under attack could be simply reinforced by moving troops from other part. a. Advantage: This tactics can weaken the chakravyuha without ever entering it. The core of the tactics is to simply hold off the enemies while wearing them down by missile weapons. b. Disadvantage: The chief disadvantage is the prolonged time required for the tactics to destroy the chakravyuha. Due to this it could degenerate into a war of attrition. The most dangerous disadvantage of this combined arms tactics is the proper training would allow the troops of chakravyuha to quickly form another formation and to destroy the opposing line. Limitations: The true nature of chakravyuha is unknown since even at the time of Mahabharata very few people is claimed to have known that. So all these tactics are by guess and the actual situation could have been quite different. However they are somewhat generalized and can possibly handle a wide spectrum of variation in the formation of chakravyuha. I shall continue to add more tactics to this list as I find them out. Thank you for this very interesting post, all the more because of possible counterattacks you've suggested. One wonders why Dhritadyumna and compnay could noy employ these tactics - perhaps they were brainwashed into thinking the vyuha is unpenetrable. The formation is very similar to a labyrinth (http://en.wikipedia.org/wiki/Labyrinth) what struck me on that wikipedia page is the reference to the battle of Jericho. the walls of jericho also had this pattern....and were broken by a specific note sounded on Joshua's horn. Sound engineering? Thank you for your comment. Military tactics evolve over time. Perhaps they contemporaries didn't know about any possible countermeasures, making the Chakravyuha invulnerable at that time. Protecting the perimeter by shield bearers won't protect the whole formation. As the arrows follow the pathway of a projectile rather than straight line, the center of the formation would still be vulnerable to arrows.